This trek distills the very essence of Ladakh and in a short span of time, provides intensive experience of the land, its people and culture. Linking two of the oldest monasteries in Ladakh at its either end, the trail passes through dramatic desert mountainscape with vivid verdant villages tucked away into the hillsides. Highlights include the gompas at Lamayuru, Wanla, Sumdochoon and Alchi and ancient wood carvings at Sumdah Chenmo, all made in the 11th century by Rigzing Zangpo. 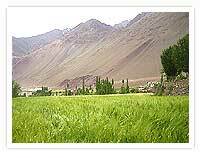 Drive five hours on the Leh/Srinagar Highway as far as Lamayuru, a splash of green against the stark desert with its charming village and a centuries old gompa. The afternoon is spent exploring the village and gompa. Lamayuru Gompa lies 15 km east of the Fatu La, with its medieval village seemingly growing out of the rocky hillside below it. Camp is set on a forested river bank below the village. The trek starts after breakfast, passing through crumbling gorges. 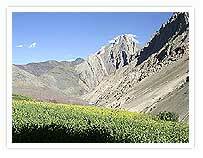 The path gradually ascends southwards, to the Prinkiti la (12,221 ft/3,726 m), reached in about an hour. Descend along a dry narrow gorge to the valley of Shillakong, through apricot orchards and beautiful willow groves, via the village of Shilla and on to Wanla village, dominated by its red-hued gompa. The trail follows the Yapola before turning off into the Ripchar Valley which is dotted with tiny green villages at short intervals. It then arrives at Hinju, a large village with a typical cluster of mud houses built onto the hillside and bright green fields stretching out into the barren land. Camp is set by the stream, just below the village. Rest day. Explore the village and its surroundings. After following the Ripchar Nallah for about an hour and a half, the trail ascends steeply up to the Konke La (16,236 ft/4,996 m) where the fierce winds on top of the pass are more than compensated for by the spectacular views all round. Descend into the pastures where the local people bring their horses, cows, dzos and yaks to graze. This is blue sheep and ibex country and if lucky, one might even spot the occasional red Himalayan fox. Camp in a meadow by the stream. Continuing along the Sumdah Tokpo, the trail reaches Sumdah Chenmo, a beautiful village with some very interesting 11th century wood carvings embedded in the ground and exposed to the elements. According to local belief, great disaster will strike the community if the carvings are moved in any way. The monolithic structures are carved in a more basis folk style. Get back on the trail and, having waded across the stream, climb up to Lanka, a grassland dotted with quaint little shepherd shelters built with piled up stones. After descending to the Sumdah Tokpo, the route turns east along the stream to Hasgo, along a very green valley and then north to Sumdah Choon, where camp is set for the night. Day 10 : At Sumdah Choon. Rest day. Explore the very old and interesting monastery which houses some unusual bronze figures crafted in a style different from that prevalent in most Ladakhi and Tibetan monasteries. The figures have predominantly Indian features, rather than the mongoloid ones seen elsewhere in Ladakh. The monastery is small and has maintained the old monastic traditions undisturbed. The trail ascends steeply to the Stakspi La (16,990 ft/5,180 m) where again there are wonderful views of the valleys on either side. A steep descent gets you to the campsite at Pulu. A short descent to the end of the trail brings us to Alchi Gompa, located near the small village of Saspol. 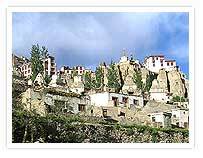 It is one of the earliest monasteries built in Ladakh, dating from the 11th century. Because it was built before the invading wars began in the 15th century, Alchi was built on lowlands, rather than on a hilltop as others were, in order to protect them from marauding armies. Camp at Alchi. Vehicles await here for the return drive to Leh.